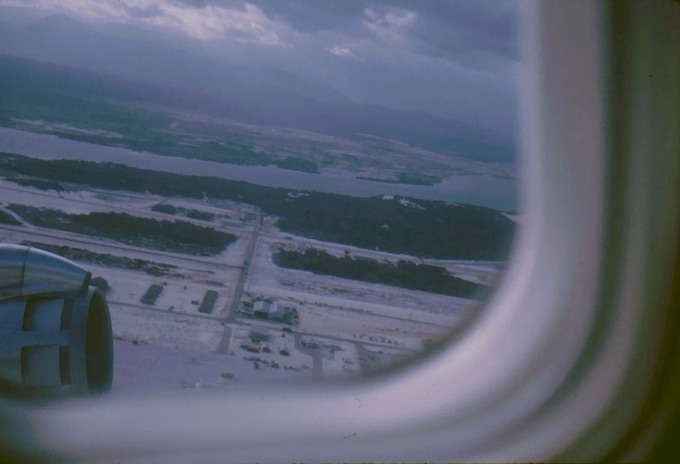 The view from the airplane window leaving Vietnam. It had been a long, difficult year. I was still me, but totally not. And what would I do now? I boarded a C-130 at the airbase in Quin Nhon, along with Sanino from Supply and McDaniels. It was a quick hop over to Cam Ranh Bay, where we'd catch a commercial airliner for the flight home. Home. It still hadn’t sunk in yet. They fed us lunch at Cam Ranh Bay. We walked into the mess hall, decorated with streamers and colored Christmas lights, and the first thing we noticed was half-gallons of fresh milk in the center of each table. Real milk. We hadn’t seen it in a year. I picked up a carton to see where it was packaged. Hawaii. The States. Roast beef, mashed potatoes, peas, chocolate cake with ice cream. Paperwork. Sign here. Sign there. I looked out the window. The mountains loomed gray in the distance, their dark secrets hidden behind a veil of silver mist. Missing limbs, pools of blood, gaping holes. Secrets that I locked away in my head, that I folded and buried deep in my heart. The engines revved and the plane taxied down the steel runway. A cheer went up as we broke through the mist. I couldn't speak. The mountains receded until they were mere bumps on a carpet of green and gray. We refueled at an Air Force base in Japan, then it was a straight shot to Seattle. Early on December 16, we landed at Fort Lewis, Washington.